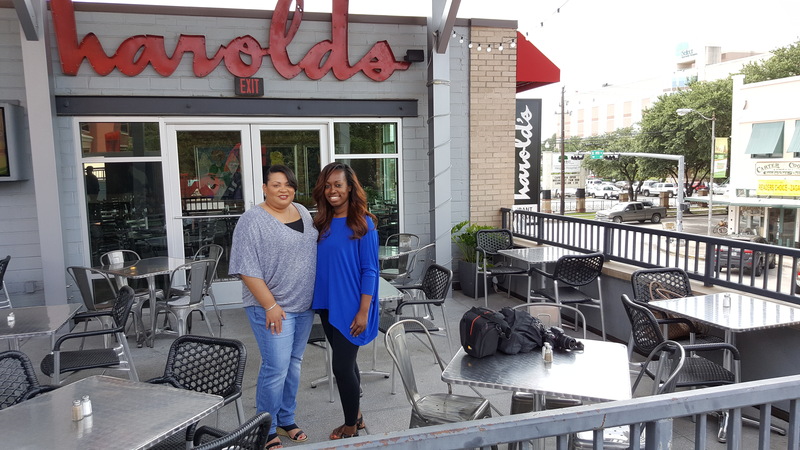 Sunday brunch just always sounds like a good idea … and 2 Girls Who Travel had been itching to try the popular restaurant Harold’s in the Heights for a few weeks now. Surprisingly, the restaurant (located on the second floor of the building) wasn’t too crowded for an early Sunday afternoon. Actually, that was quite unusual. But we were happy. No waiting and we were seated right away in a small dining room with exposed duct work in the ceiling, pretty tables and paintings on every wall. For drinks, we opted for our server’s suggestions: Val had the mimosa and Kim had the tinibellini. The mimosa tasted pretty standard – if you’ve had one, you’ve had them all. It was good and our server even told us the bar can make one with pomegranate juice. You just have to ask for it! Kim could see why the tinibellini is one of Harold’s best sellers. Made with peach-infused vodka, peach schnapps, pomegranate juice and a splash of champagne, it was just the right amount of sweet with a kick at the end. The splash of fresh lime juice topped it off nicely. The staff was very attentive and friendly, and even though the owner and chef were both on vacation (everyone needs a vacation at times), the dining room manager Elvio came and introduced himself to us and chatted with us for a while. He was kind enough to take us on a tour of the restaurant, including the beautiful upstairs terrace with an amazing view of the Heights. And of course, we know you want to read about the food … so here goes! Don’t let the name fool you … this was far from nasty! 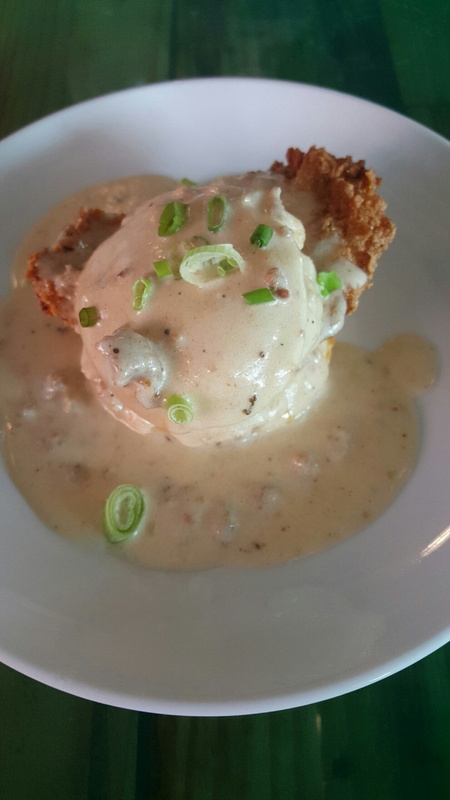 It’s a fried chicken breast in a biscuit topped with cheddar sausage gravy. It was magnificent. I loved the cheese gravy and sopped it up with every bite. 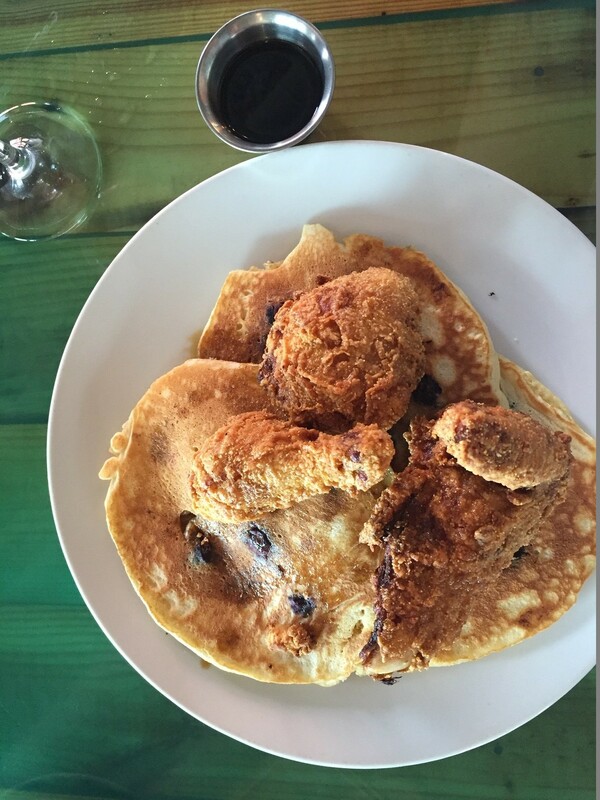 The biscuit was just that – a biscuit. No bells and whistles and none were needed. Usually I prefer dark meat to white meat, but the breast was juicy and sliced green onion topped everything off. This meal definitely gave me my southern fix. The portion size is truly an appetizer (perhaps I failed to read the menu) – it was good and I could’ve easily had another! 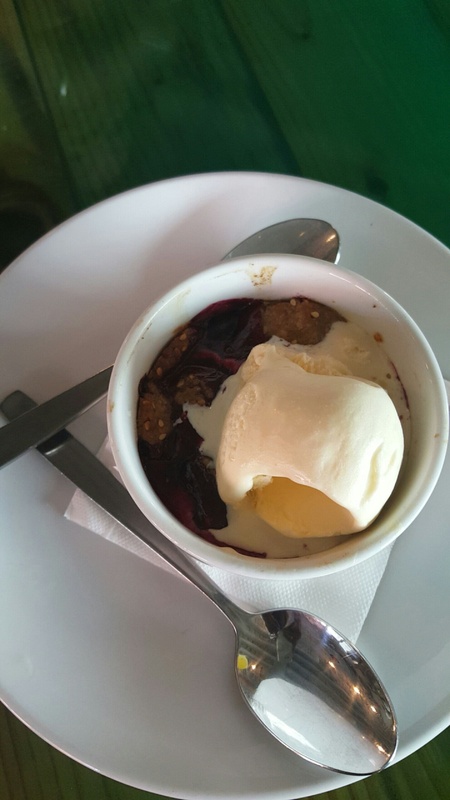 When this warm dessert came out (compliments of Elvio, the dining room manager), we were pleasantly surprised and dug right in. The tartness of the fresh blueberries offset the sweet crust of the cobbler perfectly. Needless to say, there was none left! 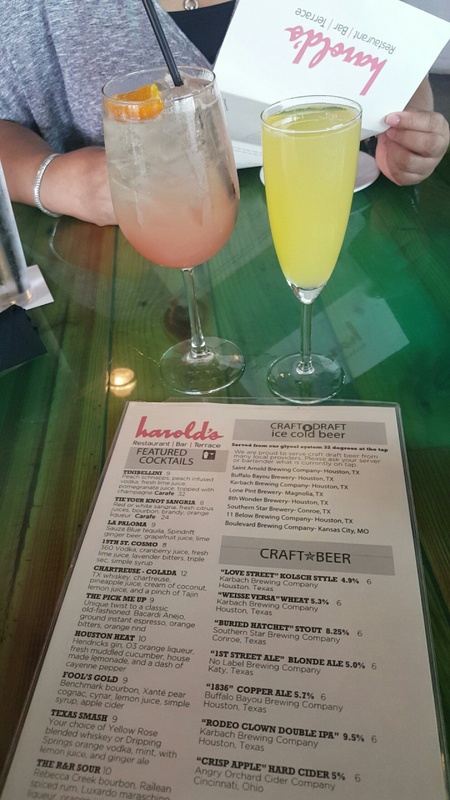 There are a few more cocktails we’d like to try, so we’d definitely give Harold’s another visit – and probably come during happy hour, which has drink specials Monday through Friday from 11am-7pm and Saturday from 3-5pm. 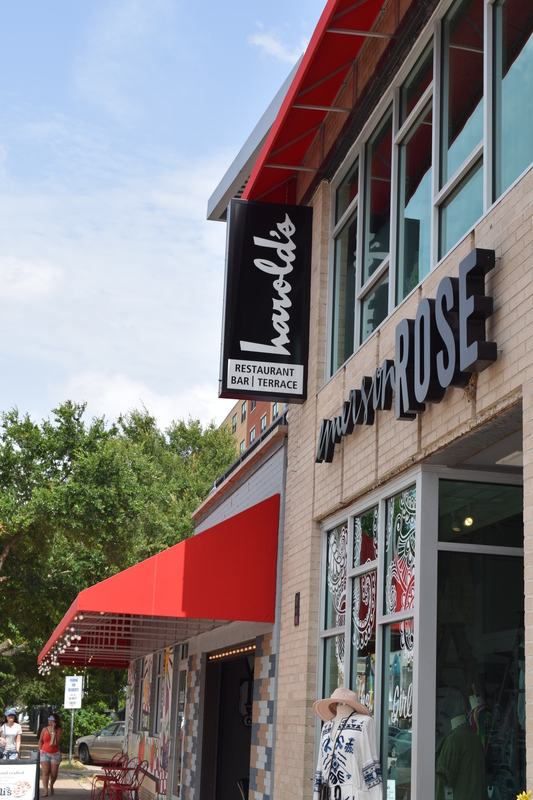 Harold’s is located at 350 W. 19th Street, Houston, TX 77008.